Memory is the retention of information over time. Although the word memory may conjure up an image of a singular, “all-or-none” process, it is clear that there are actually many kinds of memory, each of which may be somewhat independent of the others. Visual memory involves the ability to store and retrieve previously experienced visual sensations and perceptions when the stimuli that originally evoked them are no longer present. That is, the person must be capable of making a vivid visual image in his mind of the stimulus, such as a word, and once that stimulus is removed, to be able to visualise or recall this image without help. Various researchers have stated that as much as eighty percent of all learning takes place through the eye with visual memory existing as a crucial aspect of learning. 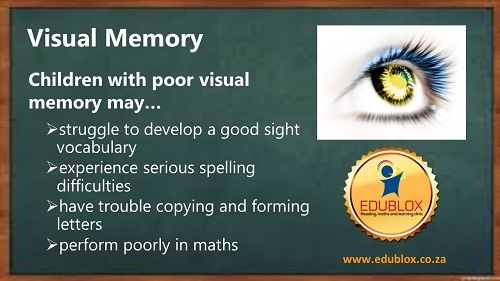 Visual memory is a critical factor in reading, spelling and writing. Children who have not developed their visual memory skills cannot readily reproduce a sequence of visual stimuli. They frequently experience difficulty in remembering the overall visual appearance of words or the letter sequence of words for reading and spelling. They may remember the letters of a word but often cannot remember their order, or they may know the initial letter and configuration of the word without having absorbed the details, that is, the subsequent letters of the word. As a result, these children fail to develop a good sight vocabulary and frequently experience serious spelling difficulties. It can be terribly frustrating for one with a visual memory deficit to perform a handwriting or word copying exercise. Children with difficulty in visual memory will have trouble copying letters, words, and sentences from a chalkboard or book. They may present with very slow handwriting, trouble forming letters, and mixing up letters or words within sentences. Producing written work on worksheets and tests may be difficult. One hundred seventy-one children with a mean age of 10.08 years participated in a study by Marjean Kulp et al. This study, conducted at the Ohio State University College of Optometry in 2004 was designed to determine whether or not performance on tests of visual perception could predict the children with poor current achievement in mathematics. Visual perception refers to the process of interpreting and organizing visual information. Visual perceptual skill is often subdivided into areas such as visual discrimination and visual memory. Visual discrimination involves the ability to attend to and identify a figure’s distinguishing features and details, such as shape, orientation, colour and size. Visual memory refers to the ability to remember a visual image. Controls for age and verbal cognitive ability were included in all regression analyses because the failure to control for verbal ability has been a criticism of some literature investigating the relation between visual and academic skills. A research study (2013) by Dr. Dénes Szűcs and team from the University of Cambridge, UK set out to compare various potential theories of dyscalculia in more than a thousand 9-year-old children. Dyscalculia refers to a severe maths learning difficulty, which affects roughly 6 percent of schoolchildren. These children show normal intelligence and their reading skills may be perfect. Dyscalculia is often described as “like dyslexia, but for maths”. Children with dyscalculia often have difficulty understanding numerical quantity. For example, they find it difficult to connect abstract symbols, such as a number, to the numerical magnitude it represents. They can’t see the connection, for instance, between five fingers and the number ‘5’. This is similar to children with dyslexia who have difficulty connecting sounds with letters. Children with dyscalculia may also have difficulty memorising maths tables, counting or skip counting in sequence and telling time. They may struggle with basic addition, subtraction, multiplication and division concepts, often needing to rely on alternative methods to solution problems (counting on fingers, drawing diagrams, etc.). The researchers found that children with dyscalculia showed poor visual-spatial memory performance. For example, they performed poorly when they had to remember the locations of items in a spatial grid. In addition, dyscalculic children’s ability to resist distraction from irrelevant information was also weak. For example, on a task where they had to choose which of two animals was larger in real life they performed poorly when the real-life larger animal was smaller in its display size. The findings challenge the notion that dyscalculia is characterised by problems with a specialised ‘number sense’ because this number sense was intact in this sample of children with dyscalculia. A test of visual memory was given to 501 urban Caucasian and 125 village Eskimo children. Village Eskimo children demonstrated significantly higher levels of visual memory. Visual memory was also found to increase significantly with age. In contrast to the striking visual differences of the urban environment, the Arctic is a world of visual uniformity. The flat, monotonous tundra and piled sea ice provide few distinctive visual markers to guide the hunting on which survival in part depends. In order to hunt and find their way back to the village, the Eskimo must attend to very small visual cues and their patterned relationships such as upturned rocks or the angle of the Big Dipper at different times of the day. 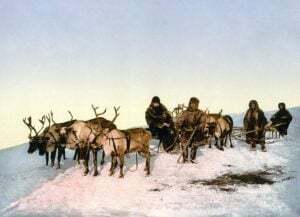 Caucasians who have travelled with the Eskimo frequently remark upon their extraordinary ability to travel through what seems to be a featureless terrain by closely observing the smallest landmarks and memorising their spatial locations. This clearly shows that visual memory can be trained! Edublox offers multisensory brain-training programs that enables learners to overcome learning obstacles and reach their full potential. Edublox is founded on pedagogical research and 30+ years of experience demonstrating that weak underlying foundational skills account for the majority of learning difficulties. Underlying foundational skills include visual memory. Specific brain-training exercises can strengthen these weaknesses leading to increased performance in reading, spelling, writing, maths and learning. 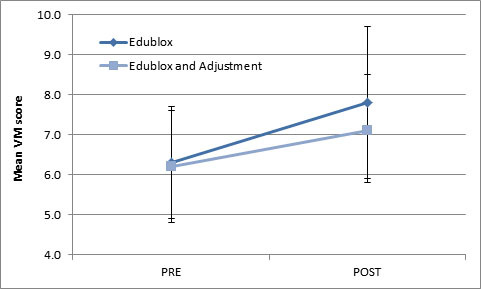 In one research study Edublox improved visual memory by 1.3 years in 5 days. Chiropractor Dr. Jaidan Mays compared the effects of Edublox training versus Edublox training combined with cervical spinal manipulative therapy on visual memory and visual sequential memory. Thirty-four Grade 5, 6 and 7 learners from an inner city school participated in Mays’s study. Two subtests of the Test of Visual Perceptual Skills were used to assess the visual memory and visual sequential memory of the learners. They were then divided into two equal groups. The members of the first group (the Edublox Group) did Edublox for 22.5 hours over a period of five days. The members of the second group (the Edublox and Adjustment Group) received the same Edublox training as the first group. But this second group also received cervical adjustment therapy every morning for the five-day period. The assessment was repeated after the five days. If you suspect that your child has a visual memory problem, contact your closest Edublox clinic for an assessment and help.